Jeff Siegel’s Santa Anita analysis offers race-by-race wagering strategies geared to rolling exotic players. The basic strategy is to isolate those horses that should be included in rolling daily doubles, pick-3s, pick-4s, pick-5s, and pick-6. It is recommended that Jeff’s selections and analysis be used to augment the reader’s own personal handicapping, though excellent results can be achieved by applying the exact rolling exotic strategy specified by Jeff’s analysis. Jeff’s recommended plays are intended for players with a moderate budget; however, the reader is encouraged to adjust Jeff’s wagering strategy to fit their preferred investment level. A horse’s final (closing) odds are irrelevant to Jeff’s rolling exotic wagering strategies; In fact, the morning line often provides a better indication as to how strongly a horse may be played in the rolling exotics pools than a horse’s actual closing odds. Jeff’s top selection always appears in bold-faced type. Unless otherwise noted, all horses listed in the analysis should be used in rolling exotic play. Usually there will no more than three horses listed; occasionally, Jeff will go 4-deep in his rolling exotic play and on a very rare occasion he will recommend a “buy the race” strategy. The Thursday opener is an allowance/optional claimer restricted to horses which ran over a synthetic surface or grass course in their most recent start. The five-runner field should be dominated by the 4/5 morning line favorite, #1 Atta Boy Pete, entered to be claimed for $20,000 but running for a $61,000 purse. 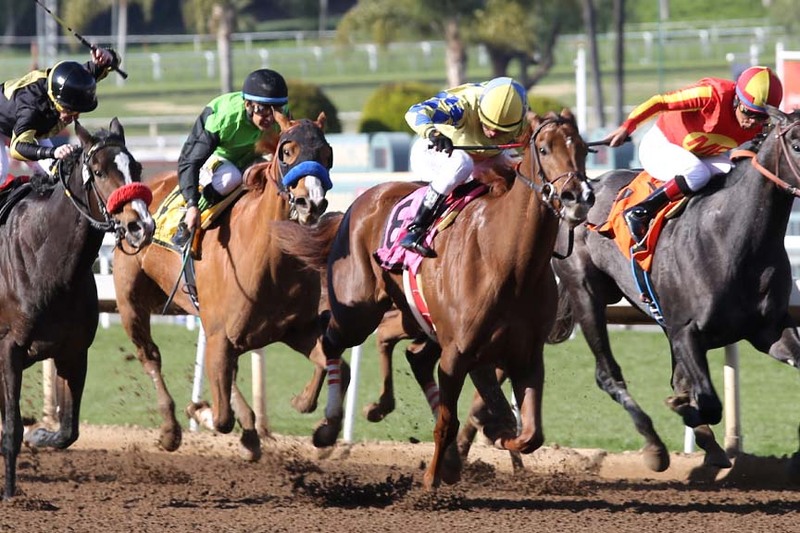 The veteran gelding has a prior win over the Santa Anita main track and catches a lackluster group without much speed that he should be able to dominate from gate to wire. In a race that we’ll otherwise pass, he’s a no-value rolling exotic single. The second race showcases middle distance, entry-level allowance sophomore fillies, with two main contenders among the five starters. #5 Kay Kay, a non-threatening third behind eased-up winner Songbird in graded stakes competition in her last outing, has a much easier task today and is listed as the 4/5 morning line favorite. There should be enough early pace to compliment her late-running style, so she’s the logical top pick, though not a single in our book. Improving #1 Emmzy broke her maiden last time out with a career top speed figure, and with another forward move today could give the favorite plenty to worry about. She should find herself in an ideal pace-stalking, ground-saving position. The third race is a starter’s allowance sprint with six runners, four of which exit the same race that saw #3 May B crossing the wire third (before being promoted to second via disqualification) at 10 cents on the dollar. Clearly, he’s not one to trust, though more than good enough to win with a repeat of his nine length romp two runs back. Meanwhile, #1 Peacenik, away since November and making his first start for Bill Spawr, has trained like he’s fit and ready and always has loved the Santa Anita main track, with five prior wins and in-the-money finishes in 12 of 16 career starts. He’s run well fresh in the past and, in a sign of confidence, returns protected. Let’s make him a straight play and rolling exotic single at or around his morning line of 3-1. Maiden $50,000 claiming 3-year-olds meet over a mile in the fourth race, and in another light affair we’ll go two-deep in our rolling exotics. #4 Trinitas Soldier will be a major player with a repeat of his good runner-up effort vs. tougher two races back; he’s been freshened since early April and is the logical top pick at 7/5 on the morning line. #5 Lord Snow hasn’t been out since October but he’ll probably be the controlling speed in his first try around two turns. The Mark Glatt-trained gelding worked seven furlongs in 1:25 seconds 12 days ago to indicate his fitness, and showed ability in a pair of starts as a juvenile vs. tougher foes than he’s seeing today. He’ll probably be a bit better price so let’s put Lord Snow on top and have an extra ticket or two with him in rolling exotic play. Maiden special weight juvenile fillies sprint five furlongs in the fifth race. #7 Alpenhorn was nosed out in her debut in April at Los Alamitos while winding up more than eight lengths clear of the rest, an effort that if repeated clearly makes her the one to beat today. #5 Blue Over You is a sneaky first-timer from the Spawr barn; she’s bred for speed on both sides of her pedigree and her San Luis Rey Downs work tab indicates plenty of ability. We’ll use both in our rolling exotics but at 6-1 on the morning line Blue Over You is the better price and therefore earns top billing. The sixth race, at seven furlongs, is restricted to 3-year-olds that have started for $50,000 or less and have not won three races. #6 American League, a first-time gelding, removes blinkers (love that angle), lands the cozy outside post, makes a major jockey switch to Tyler Baze and shows a sharp 46 3/5 seconds half mile workout since his last outing. He should be able to draft into an ideal stalking spot. #4 Classico exits a monster race and should greatly appreciate this softer assignment. He has speed figures that are good enough to win at this level and is reunited with Rafael Bejarano, who won on him two races back. Let’s give a slight edge on top to American League but use both in our rolling exotics. The featured seventh is a split of the opener, a second-level allowance extended sprint for runners that raced on synthetic or grass last time out. #5 Pay the Fine shouldn’t be inconvenienced by the return to dirt and probably beats this field with a repeat of his race before last. The main concern is his zero-for-five lifetime mark over the Santa Anita main track, but he has numbers that make him a solid fit. #7 Texas Two Step perked up with a sharp runner-up effort down the Hillside Course last month; he’s another with a lackluster record over this particular main track, though he’s won on dirt in the past. The Peter Miller-trained gelding should be rolling in the final furlong. We’ll try to get by using just these two but if you can afford to spread a little deeper, go right ahead. The finale is a seven furlong bottom-rung maiden claimer for fillies and mares. #1 Goliath’s Girl, second while more than three clear of the rest at this level in her most recent start, should be on or near the lead throughout and deserves the edge on top, though at 8/5 on the morning line and likely to go lower she’ll probably not offer any wagering value. #8 Too Much Drama, far back in her debut vs. tougher, didn’t get the best of runs (slow start, wide trip) and seems sure to perform better with a clean trip at this level. On pure numbers she really won’t have to improve all that much to win. #9 Call My Bluff, first off the claim for Dean Greenman, is a sneaky Bay Area route-to-sprint invader with the proper closing style for this extended sprint distance. From her outside draw, she’ll have every chance to wear down the leaders. Let’s use all three in our rolling exotics and then press a bit on top keying Call My Bluff.